Just sit back & relax…with the most knowledgeable portable-seating professionals. 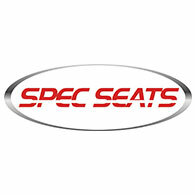 Spec Seats is a close-knit family organization. Based on over 100 years of hands-on, personal experience in the custom seating industry, we continue to build long lasting relationships. We’re not just interested in selling our products—we are committed to securing and building strong, professional relationships by providing the finest quality/event tested products—honesty—integrity—customer service—dedicated proven performance. Our engineers will design a floor plan for your facility, allowing for maximum-capacity seating in keeping with the most current standards and regulations. We’ll also customize and/or modify our products and assist you in selecting the best portable-seating system for your specific applications. We enjoy challenges and support your various requirements/needs—constantly innovating—updating. Inquire about our SuperChair (the most comfortable folding chair ever! ), Seat – Row – Selection Numbering Systems and Promotional Channel Bumper.